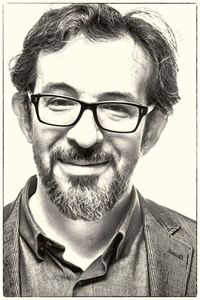 As the founding director of the Collaboratory for Adaptive Sensory Technologies at the Salk Institute, Sergei Gepshtein studies visual perception and visually guided behavior using methods of sensorimotor psychophysics and computational neuroscience. One of Sergei’s long-standing interests is the interaction between two aspects of visual perception: the entry process called early vision and the constructive process called perceptual organization. Early vision captures visual information and thus determines the boundaries between the visible and invisible. Perceptual organization creates visual meaning; it constructs our visual experience (the “visual world”) from the information captured by early vision. The visual system as economist: neural resource allocation in visual adaptation. Snider J, Lee D, Poizner H & Gepshtein S (2015). Prospective optimization with limited resources. PLoS Computational Biology, 11 (9): e1004501. doi:10.1371/journal.pcbi.1004501. Gepshtein S, Li X, Snider J, Plank M, Lee D & Poizner H (2014). Dopamine function and the efficiency of human movement. Journal of Cognitive Neuroscience, 26 (3), 645-657. Sejnowski TJ, Poizner H, Lynch G, Gepshtein S & Greenspan RJ (2014). Prospective optimization. Proceedings of the IEEE, 102 (5), 799-811. Gepshtein S, Lesmes LA & Albright TD (2013). Sensory adaptation as optimal resource allocation. Proceedings of the National Academy of Sciences, USA 110 (11), 4368-4373. Jurica P, Gepshtein S, Tyukin I & van Leeuwen C (2013). Sensory optimization by stochastic tuning. Psychological Review, 120 (4), 798-816. Kubovy M, Epstein W, & Gepshtein S (2013). Visual perception: Theoretical and methodological foundations. In Healy AF & Proctor RW (Eds), Experimental Psychology, Second edition, 85-119, Volume 4 in Weiner IB (Editor-in-Chief) Handbook of Psychology. John Wiley & Sons, New York, USA. Alexander DM, Jurica P, Trengove C, Nikolaev AR, Gepshtein S, et al (2013). Traveling waves and trial averaging: The nature of single-trial and averaged brain responses in large-scale cortical signals. NeuroImage, 73, p. 95-112. Plomp G, van Leeuwen C & Gepshtein S (2012). Perception of time in articulated visual events. Frontiers in Psychology, 3:564, 1-8. Wagemans J, Feldman J, Gepshtein S, Kimchi R, Pomerantz JR, et al (2012). A century of Gestalt psychology in visual perception. Conceptual and theoretical foundations. Psychological Bulletin, 138 (6), 1218-1252. Vidal-Naquet M & Gepshtein S (2012). Spatially invariant computations in stereoscopic vision. Frontiers of Computational Neuroscience, 6:47, 1-13. Gepshtein S, Tyukin I & Kubovy M (2011). A failure of the proximity principle in the perception of motion. Humana Mente, 17, 21-34. Gepshtein S (2010). Two psychologies of perception and the prospect of their synthesis. Philosophical Psychology, 23 (2), 217-281. Nikolaev AR, Gepshtein S, Gong P & van Leeuwen C (2009). Duration of coherence intervals in electrical brain activity in perceptual organization. Cerebral Cortex, 20 (2), 365-382. Gepshtein S (2009). Closing the gap between ideal and real behavior: Scientific vs. engineering approaches to normativity. Philosophical Psychology, 22 (1), 61-75. Nikolaev AR, Gepshtein S, Kubovy M & van Leeuwen C (2008). Dissociation of early evoked cortical activity in perceptual grouping. Experimental Brain Research, 186 (1), 107-122. Gepshtein S, Elder JH & Maloney LT (2008). Perceptual organization and neural computation. Journal of Vision, 8 (7), 1-4. Gepshtein S & Kubovy M (2007). The lawful perception of apparent motion. Journal of Vision, 7 (8):9, 1-15. Gepshtein S, Tyukin I & Kubovy M (2007). The economics of motion perception and invariants of visual sensitivity. Journal of Vision, 7 (8):8, 1-18. Gepshtein S, Seydell A & Trommershäuser J (2007). Optimality of human movement under natural variations of visual-motor uncertainty. Journal of Vision, 7 (5):13, 1-18. Trommershäuser J, Gepshtein S, Maloney LT, Landy MS & Banks MS (2005). Optimal compensation for changes in task relevant movement variability. Journal of Neuroscience, 25 (31), 7169-7178. Gepshtein S & Kubovy M (2005). Stability and change in perception: Spatial organization in temporal context. Experimental Brain Research, 160 (4), 487-495. Gepshtein S, Burge J, Ernst M & Banks MS (2005). The combination of vision and touch depends on spatial proximity. Journal of Vision, 5 (11):7, 1013-1023. Banks MS, Gepshtein S & Landy MS (2004). Why is spatial stereoresolution so low? Journal of Neuroscience, 24 (9), 2077-2089. Kubovy M and Gepshtein S (2003). Perceptual grouping in space and in space-time: An exercise in phenomenological psychophysics. In Behrmann M, Kimchi R, and Olson CR (Eds) Perceptual Organization in Vision: Behavioral and Neural Perspectives, 45-85. Lawrence Erlbaum, Mahwah, NJ, USA. Gepshtein S & Banks MS (2003). Viewing geometry determines how vision and touch combine in size perception. Current Biology, 13 (6), 483-488. Kubovy M & Gepshtein S (2000). Gestalt: From phenomena to laws. In Boyer KL and Sarkar A (Eds) Perceptual Organization for Artificial Vision Systems, 41-71. Kluwer Academic Publishers, Boston, MA, USA. Gepshtein S & Kubovy M (2000). The emergence of visual objects in space-time. Proceedings of the National Academy of Sciences, USA, 97 (14), 8186-8191.